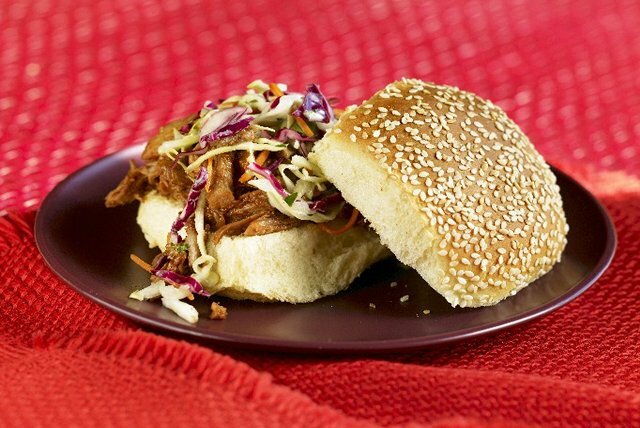 Slow-cooker BBQ pork is always delicious—particularly when you serve it shredded in sandwiches with some crunchy coleslaw. Rub meat with combined seasonings. Place in slow cooker; top with 1/4 cup barbecue sauce. Cover with lid. Cook on LOW 8 to 10 hours (or on HIGH 4 to 5 hours). Meanwhile, combine coleslaw blend and dressing. Remove meat from slow cooker; cut off and discard excess fat. Chop meat into small pieces or shred with fork. Return to slow cooker with remaining sauce; stir to coat with sauce. Fill buns with meat mixture and coleslaw just before serving. For added colour and texture, serve with a mixed green salad tossed with your favourite Kraft Dressing. Prepare using your favourite Bull's-Eye Barbecue Sauce.